Authorization letter is written by a person who holds an authorized position. The letter of authorization allows a person to take some action. It is also used to grant permission for some activity. Letter of Authorization is an important document, so it needs to have a clear mention about the person who is entrusted the task, nature of the task involved, validity or duration till which the person is authorized and name and designation of the person by whom he is authorized. Here are some important sample formats like Volunteer Thank You Letters which make your work easy. 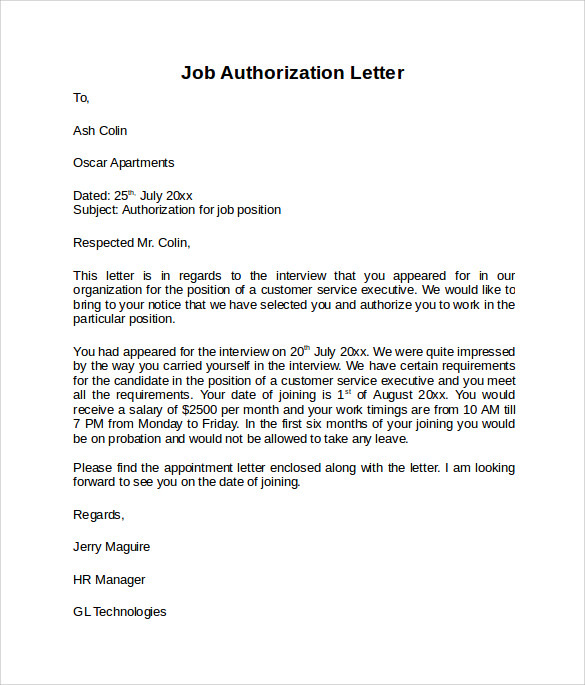 This sample letter of authorization is written by the HR manager of a company to appoint a specific individual for a job. The letter states the appointment date of the employee and mentions his remuneration besides praising the candidate for the way he carried himself during the interview. This sample letter of authorization is written to delegate duties to a colleague by an individual who is going for a leave. The letter is addressed to the concerned department and mentions the leave period clearly on the first half, followed by the duties his substitutes shall be carrying out during his absence. 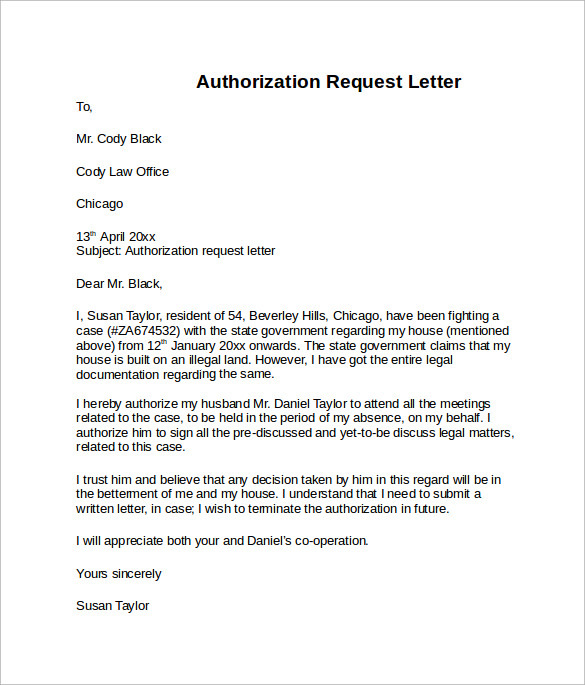 This sample letter of authorization pertains to a legal case, where the applicant authorizes her husband to handle all matters related to the case proceeding during her absence. The authorization includes pre- discussed and yet to be discussed matters on the case. The writers end the letter by showing her complete faith on husband’s decisions. 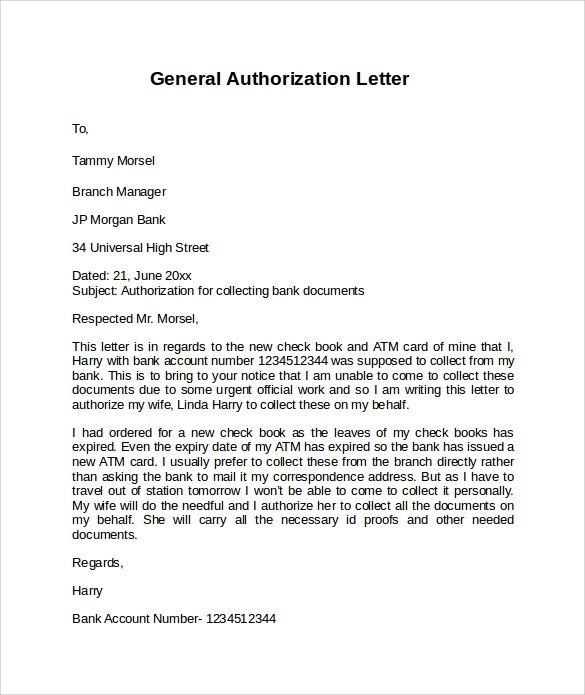 This sample letter of authorization is written by an account holder to the bank manager where he authorizes his wife to collect certain important financial documents on his behalf. In the second half he states his reason for not being able to reach the bank. The letter ends with all the relevant banking details and information that would help the manager to complete the process in an efficient manner. This sample letter of authorization is available in PDF format and is addressed to no one in particular. It is very short letter, which is completely customizable. The letter authorizes an employee to handle all matters related to a certain domain on the writer’s behalf. The writer also mentions that she has the power to sign documents and use his 2 ID cards for the said purpose. 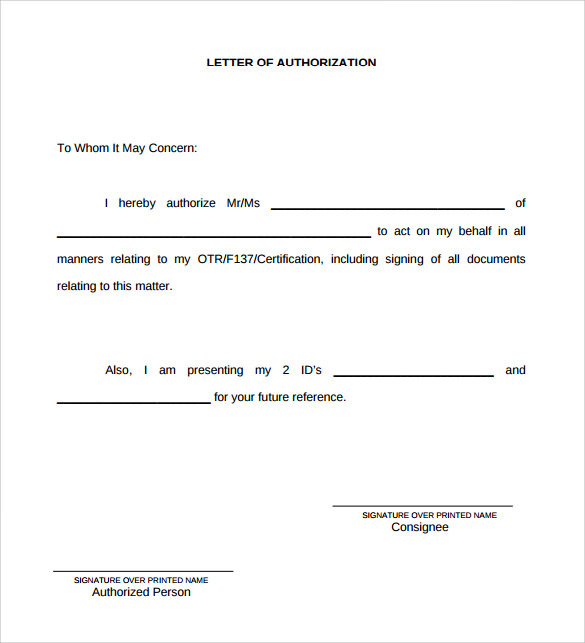 This sample of printable letter of authorization issued in a way whereby it can be used by an individual as well as by a company to authorize an individual to represent them to enforce judgments, make financial transactions and attend meetings. 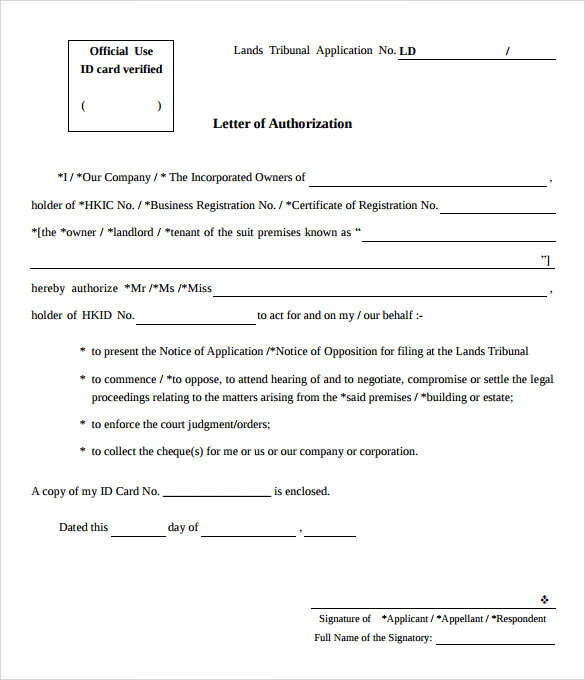 The signature column and full name of the authorizing person and date is given in the bottom right hand corner of the page. This free sample letter of authorization is an example of how a letter of authorization should be written. This sample starts by detailing each and every step and explaining the importance of each paragraph and how it should be written. 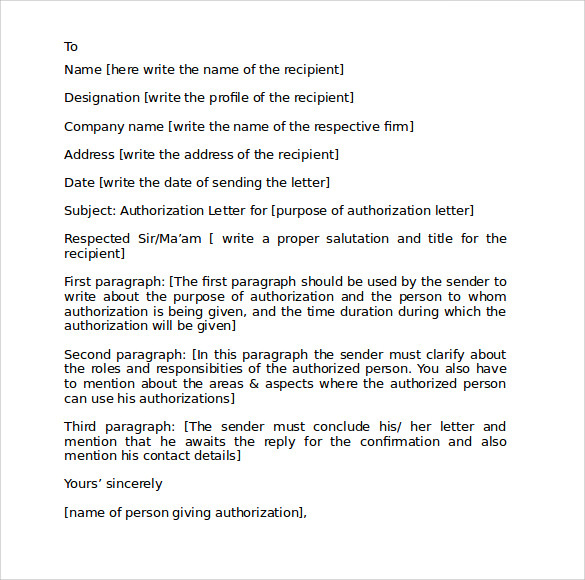 This example can be used by any individual for writing any kind of authorization letter. 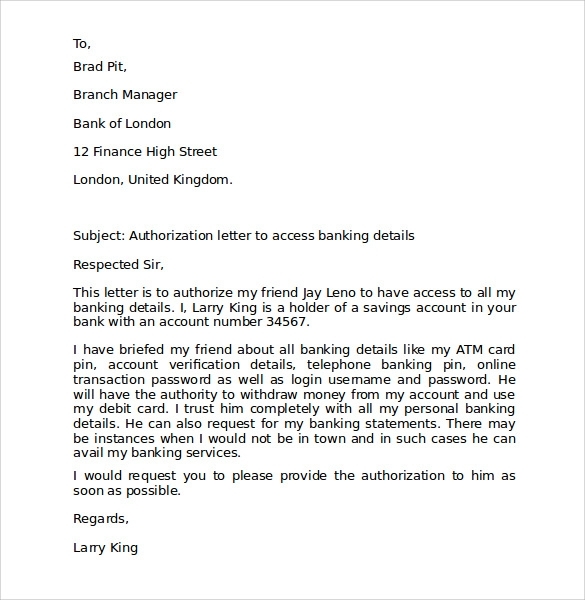 This editable version of sample letter of authorization is written by an individual granting his friend access to all his banking details. In the second paragraph he specifies that he has already shared all his banking details with his friend and has complete faith on his judgment and decisions. The letter ends by requesting the bank to grant him access to his account at the earliest. 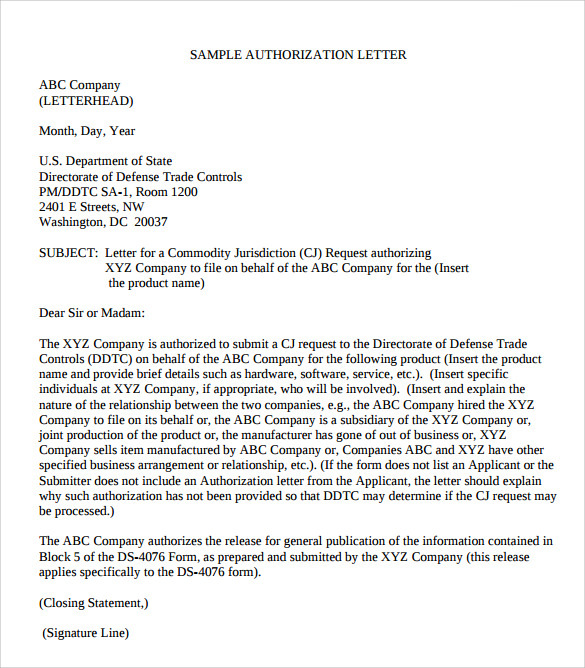 This sample letter of authorization is written on behalf of a company to the director of Defense Trade Control regarding commodity jurisdiction authorizing request. The letter seeks to authorize a particular company to file ACJ request on behalf of the parent company. The letter specifies that both the company has common ties whereby it’s entirely legal for them to work on behalf of one another. The letter is completely customizable and you can add your own closing statement or edit the content as per requirement. 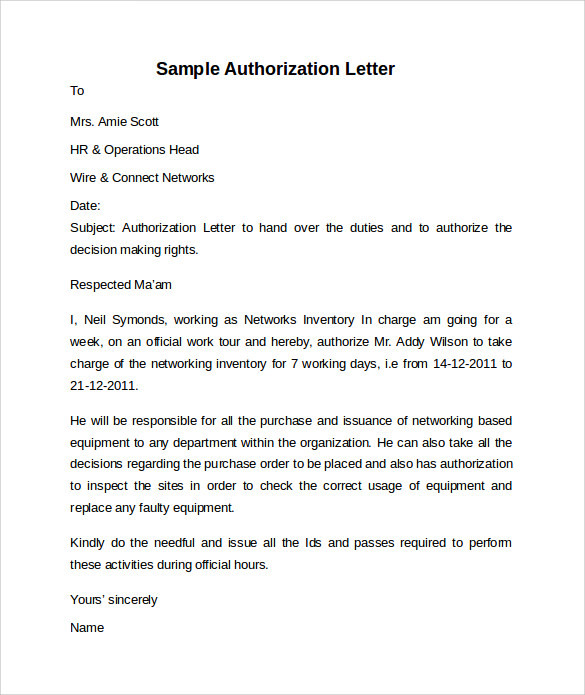 Authorization letters are a common phenomenon in any business setting and hundreds of them are written everyday ensure a smooth functioning in any setup. The above given examples would help you to draft an authorization letter in a professional way without wasting too much time in researching about its forma and type.